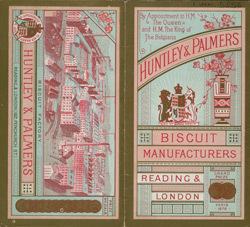 This is an advertisement for Huntley & Palmers, a well known 19th Century biscuit manufacturing company. In 1822 Joseph Huntley opened an ironmongers opposite his brothers bakery in London Street, Reading. Joseph made airtight boxes for his brother Thomas’, biscuits so that they could be transported across the country staying fresh and unbroken. George Palmer joined the company in 1841 and introduced machinery to the biscuit production. By 1857, 5000 people were employed in their factory and it was the largest biscuit factory on the world. Palmer used their growing reputation to establish global links and soon biscuits were being exported to America, India and Australia.